Hyper-V Network virtualization: Programmable Hyper-V switch (a new building block of Microsoft's software-defined networking solution); VXLAN encapsulation support; Microsoft Software Load Balancer interoperability; better IEEE Ethernet standard compliance. Rolling Hyper-V cluster update: Unlike upgrading clusters from Windows 2008 R2 to 2012 level, Windows Server 2016 cluster nodes can be added to a Hyper-V Cluster with nodes running Windows Server 2012 R2. The cluster continues to function at a Windows Server 2012 R2 feature level until all of the nodes in the cluster have been upgraded and the cluster functional level has been upgraded. Storage Resiliency feature of Hyper-V is formed for detecting transitory loss of connectivity to VM storage. VMs will be paused until connectivity is re-established. Microsoft announced a new installation option, Nano Server, which offers a minimal-footprint headless version of Windows Server. It excludes the graphical user interface, WoW64 (support for 32-bit software) and Windows Installer. It does not support console login, either locally or via Remote Desktop Connection. All management is performed remotely via Windows Management Instrumentation (WMI), Windows PowerShell and Remote Server Management Tools (a collection of web-based GUI and command line tools). However, in Technical Preview 5, Microsoft has re-added the ability to administer Nano Server locally through PowerShell. According to Microsoft engineer Jeffrey Snover, Nano Server has 93% lower VHD size, 92% fewer critical security advisories, and 80% fewer reboots than Windows Server. Nano Server is only available to Microsoft Software Assurance customers and on cloud computing platforms such as Microsoft Azure and Amazon Web Services. Starting with the new feature release of Windows Server version 1709, Nano Server can only be installed inside a container host. 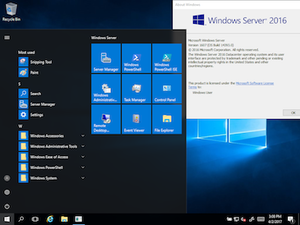 Windows Server 2016 Technical Preview, released on October 1, 2014, was the first beta version of the operating system made publicly available. Its version number was 6.4.9841. Installation options: Minimal Server Interface was made default and renamed the Server installation option to “Server with local admin tools”. Installation options: The Server installation option had been renamed to “Server with Desktop Experience” having the shell and Desktop Experience installed by default. Due to the structural changes required to deliver the Desktop Experience on Server, it is no longer possible to convert from Server with Desktop Experience to Server Core or to convert Server Core up to Server with Desktop Experience. Windows Server, version 1709 (based on Windows 10 Fall Creators Update) was released on October 17, 2017. The release has dropped the Windows Server 2016 name and is just called Windows Server by Microsoft. It is offered to the Microsoft Software Assurance customers who have an active Windows Server 2016 license and has the same system requirements. This is the first Windows Server product to fall under the "Semi-Annual Channel" (SAC) release cadence. This product only features the Server Core and the Nano Server modes. Of the two, only the Server Core mode of the OS can be installed on a bare system. The Nano Server mode is only available as an operating system container. Windows Server, version 1803 (based on Windows 10 April 2018 Update) is the second Semi-Annual Channel release of Windows Server. It is also the final version to be branched off the Server 2016 codebase, as the next release shares the version number 1809 with Windows Server 2019. ^ a b Chapple, Erin (September 26, 2016). "Announcing the launch of Windows Server 2016". Hybrid Cloud. Microsoft. ^ a b c Foley, Mary Jo (October 12, 2016). "Microsoft's Windows Server 2016 hits general availability". ZDNet. CBS Interactive. ^ "December 19, 2018—KB4483229 (OS Build 14393.2670)". Microsoft Help. Microsoft. Retrieved October 13, 2018. ^ "Announcing Windows Server Insider Preview Build 17046". Windows Blog. Microsoft. ^ "Microsoft Product Lifecycle". Microsoft Support. Microsoft. Retrieved December 7, 2016. ^ a b "Announcing availability of Windows Server Technical Preview and System Center Technical Preview". Hybrid Cloud. Microsoft. March 17, 2015. Retrieved April 1, 2015. ^ Mathers, Bill; Poggemeyer, Liza; Tobin, John (September 8, 2017). "What's new in Active Directory Federation Services for Windows Server 2016". Microsoft Docs. Windows Server, Identity and access. ^ O'Shea, Mark (September 4, 2016). "What's New In Windows Server 2016 Standard Edition Part 9 – Management And Automation". Microsoft Australia OEM Team blog. Microsoft. ^ "About Windows Containers". Retrieved November 1, 2016. ^ "Remote Direct Memory Access (RDMA) and Switch Embedded Teaming (SET)". Microsoft. May 17, 2016. Retrieved July 6, 2016. ^ Jindal, Kriti (February 9, 2016). "Introducing Server management tools". Nano Server Blog. Microsoft. ^ Neil, Mike (April 8, 2015). "Microsoft Announces New Container Technologies for the Next Generation Cloud". Server & Cloud Blog. Microsoft. ^ Snover, Jeffrey; Mason, Andrew; Back, Alan (April 8, 2015). "Microsoft Announces Nano Server for Modern Apps and Cloud". Windows Server Blog. Microsoft. ^ Patrizio, Andy (February 10, 2015). "Microsoft to release next generation of Windows Server in 2016". Network World. IDG. ^ Vincent, James (March 9, 2017). "Microsoft unveils new ARM server designs, threatening Intel's dominance". The Verge. Vox Media. ^ Foley, Mary Jo (March 8, 2017). "Windows Server on ARM: It's happening". ZDNet. CBS Interactive. ^ Bright, Peter (March 8, 2017). "Microsoft's latest open source servers shown off with Intel, AMD, and even ARM chips". Ars Technica. Condé Nast. ^ Foley, Mary Jo (March 10, 2017). "Microsoft's Windows Server on ARM move: More questions and answers". ZDNet. CBS Interactive. ^ "Announcing Windows Server Insider Preview Build 16237". Windows Blog. Microsoft. ^ Bright, Peter (December 4, 2015). "Windows Server 2016 moving to per core, not per socket, licensing". Ars Technica. Condé Nast. Retrieved December 5, 2015. ^ Microsoft (2017). "Windows Server 2016 Licensing Datasheet - Microsoft" (PDF). Microsoft. Retrieved October 8, 2017. ^ Berkouwer, Sander (May 5, 2015). "Windows Server 2016 Technical Preview 2 now available". The things that are better left unspoken. ^ a b Anderson, Kareem (November 19, 2015). "Microsoft has released Windows Server 2016 Technical Preview 4". WinBeta. ^ Jawad, Usama (September 25, 2017). "Microsoft launches Windows Server version 1709". Neowin. Retrieved March 12, 2018. ^ "Introducing Windows Server, version 1709". Microsoft Docs. Microsoft. Windows Server.